New report proposes an annual increase of 55 cents for the next three years, bringing minimum wage to $12.65 per hour by 2021. Protesters calling for a $15/hour minimum wage take to the streets back in October. Minimum wage workers in Nova Scotia could see a big bump in pay next year, if the province follows through with new recommendations from its minimum wage review committee. The panel is proposing Nova Scotia increase its minimum wage annually by 55 cents over the next three years, raising it to $12.65 an hour by 2021. The recommended multi-year adjustment is meant to rectify an error in how wage increases are currently calculated. The formula used by the province since 2008 fixes the rate each year based on inflation, as set by the Consumer Price Index. The goal is for a full-time employee making minimum wage in a community the size of Sydney to meet Canada's low-income cutoff (LICO). But the current formula uses a work week of 40 hours, and not the 37 hours for which full-time employees are actually paid and with which Statistics Canada sets the CPI. “Once we looked at Stats Canada’s numbers, then we realized that both of the numbers they used are based on the 37-hour work week,” says Danny Cavanagh, president of the Nova Scotia Federation of Labour and a member of the review committee. Currently, an employee paid 37 hours a week, 50 weeks of the year, would have to earn $11.90 per hour to reach the low-income cut-off point—nearly a dollar more than what they make today. 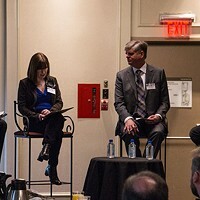 By keeping pace with inflation, plus adding an additional 30 cents a year to make up for the 40-hour overcalculation, Nova Scotia's 27,000 minimum-wage employees will finally meet the definition of low-income by 2021. Nova Scotia currently has the lowest minimum wage in Canada. Saskatchewan beats us by just six cents. The province last increased its minimum wage back in April by 15 cents, bringing it to $11 per hour. The province also has an “inexperienced” minimum wage rate where workers can be paid $0.50 less than the minimum if the employee has fewer than three months total work experience. 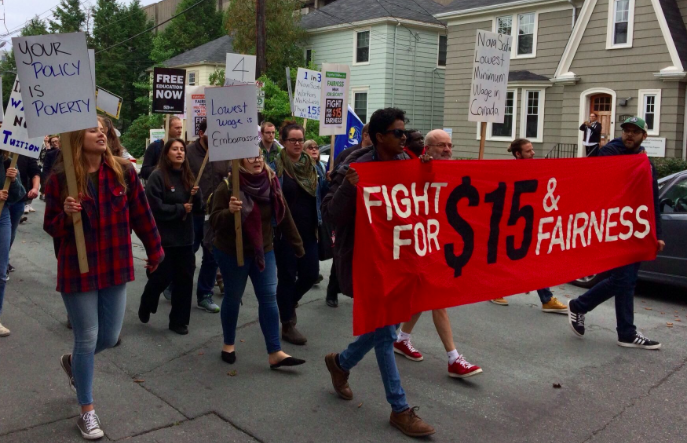 Activists and labour advocates have long called for Nova Scotia to dramatically increase its regulated wages, with a protest held back in October outside labour and advanced education minister Labi Kousoulis’ office arguing for a $15 minimum. 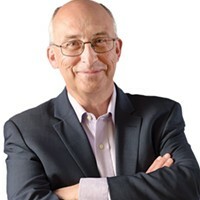 Gary Burrill, leader of the Nova Scotia NDP and a speaker at that rally, said on Tuesday that the wage review committee's latest recommendation doesn't go far enough. Cavanagh agrees with that assessment and says he still plans to fight for a $15 minimum wage. 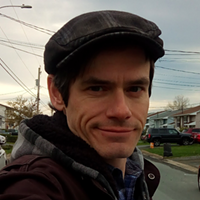 But he also points out that the five-percent raise being proposed by the review committee—about an extra $20 a week—would still mean a lot to many low-income Nova Scotians. “We still don’t think that goes far enough, right, but it’s better than what they received last year,” he says. The province says a decision on Nova Scotia's minimum wage will be made in early January. 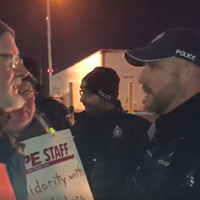 Ottawa cops show solidarity with fellow officers in Halifax by jailing picketers outside mail facilities. The myth of “your tax dollars at work” and why government shouldn't be treated as a corporation. Everyone agrees people should be making more money. How we get there is up for debate.